1.0.2 Best Life Struggle Quotes in Hindi which give’s all power to all struggling people to fight with their problems and obstacles. 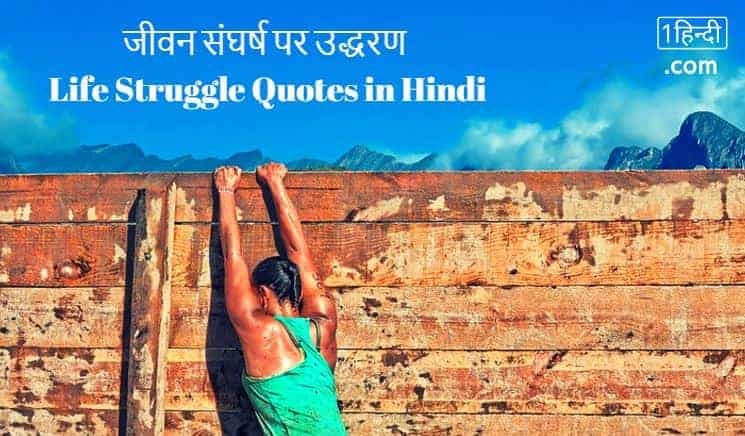 क्या आप जीवन संघर्ष के बेहतरीन उद्धरण Life Struggle Quotes in Hindi पढना चाहते हैं? क्या आप जानते हैं जीवन ही संघर्ष है? कैसे ! चलिए समझते हैं? Best Life Struggle Quotes in Hindi which give’s all power to all struggling people to fight with their problems and obstacles. #1 If you solve your problem, then what is the need of worrying. If you cannot solve it then what is the use of worrying. #2 You are what you do, Not what you say -You will Do. #3 You can’t solve a problem on the same level it was created, You have to rise above it to the next level. #4 Whatever the problem, Be the part of the solution. Don’t just sit around raising, Questions and Pointing out Obstacles. #5 The struggle is part of the life story. #6 No matters How you feel, Get Up, Dress Up, Show Up and never Give Up. #8 Loving yourself is the greatest revolution. #9 If you want to love me now, then you have to learn to love my past. Because the struggles I want through yesterday made me who I am today. #17 Struggling people never Plan to rest, they Always plan to struggle More effectively instead of rest Because they know -Time has no holidays. #18 The duck looks smooth & calm on top of water, but, under that there is restless pedaling.. Nothing is worth with out struggle in real life. #19 A race horse that consistently runs just 1 second faster than others is worth millions of dollars more. Don’t compromise on 2nd position in life. all thought is vey nice and very usefull..
Because this is motivated everyone. गांधी इरविन समझौता क्या था? What is Gandhi Irwin Pact in Hindi?